Wheelersburg senior Sarah Claxon hit a two RBI double in the bottom of the sixth to help bolster the Pirates lead over Minford. Minford junior Hannah Tolle came in for relief of starter Andi Blevins in Thursday’s loss to Wheelersburg. Wheelersburg’s Addi Collins scored the game tying run in the Pirates win over Minford Thursday. 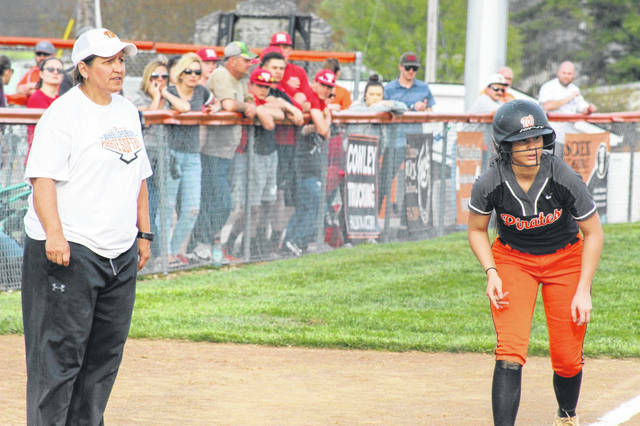 WHEELERSBURG – For the first 5 1/2 innings of their game against Minford Thursday night, The Wheelersburg Pirates were on the cusp of breaking through. The Pirates had balls hit to the wall and were getting on base, but when it came to crossing home plate and adding a run to their scoring column, they had fallen just short. In fact, both teams remained scoreless for the first five innings, until Minford added two runs in the top of the sixth. With their backs against the wall and just six outs left in Thursday’s game, Wheelersburg knew they had to score. 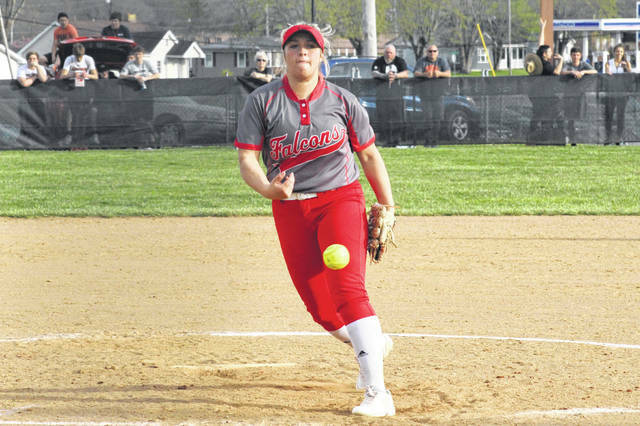 Thanks to an error by Minford on a routine play in the bottom of the sixth, Wheelersburg scored their first run in Thursday night’s game, and continued to score from there. By the end of the inning, Wheelersburg led Minford 6-2, giving themselves a large cushion, needing just three outs to end the game. 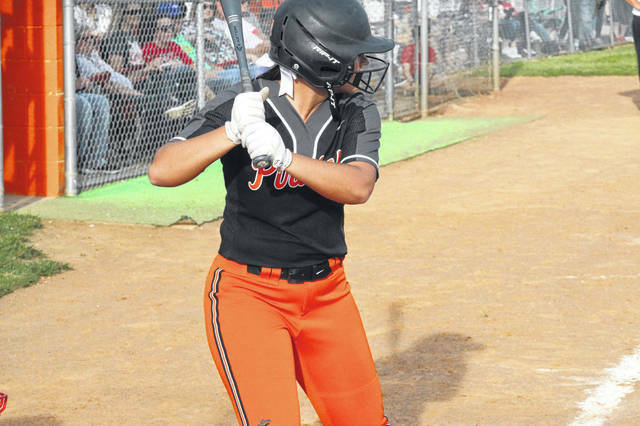 A Laney Eller sacrifice fly lead to big hits by Riley Hughes, which brought home two Pirate runners, and Sarah Claxon, which brought home another two pirate runners, officially tipping the scale in Wheelersburg‘s favor. In their nine games prior to their game with Minford on Wednesday, the Pirates were outscoring their opponents 95 to 21. With only a +4 run differential in their games against Minford the last two days, Ruby knows just how important these games will be come tournament time next month. With Thursday’s win, Wheelersburg improves to 7-0 in SOC II play. With games against Waverly and Oak Hill remaining on their conference schedule, Ruby acknowledged how important Thursday’s win is if her Pirates want to compete for another SOC II crown.